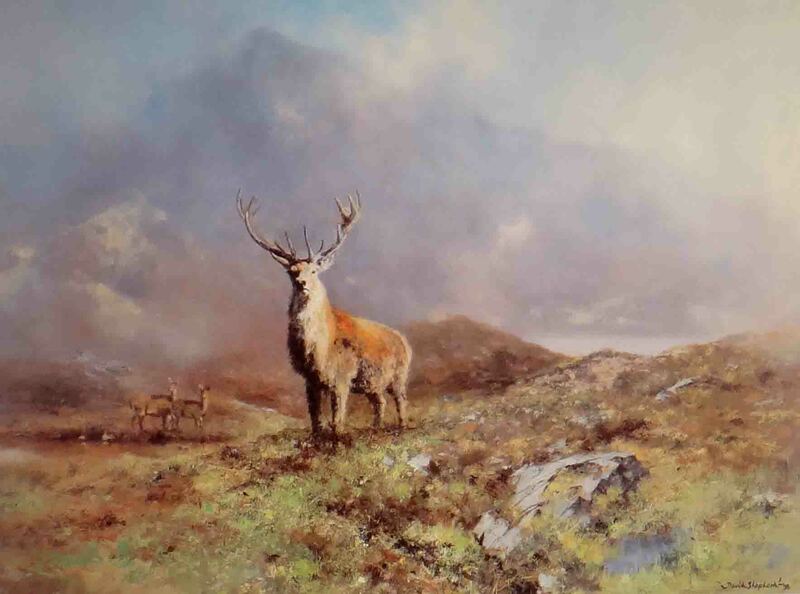 Image Size 17" x 23"
Biography of wildlife artist, David Shepherd, CBE, FRSA, FRGS, OBE. Internationally recognized as the world's best wildlife artist. David Shepherd has at all times felt that he had a duty in the form of conservation towards the world and the animals that inhabit our planet. In his lifetime, David Shepherd has painted and drawn many pictures, and is able to share his many tales and experiences with people internationally, often talking at charity dinners and prestigeous social events. His persona lends itself naturally to this cause, as he is a most approachable down-to-earth fellow who enjoys sharing his pleasure of art and his concern over the diminishing wildlife throughout the world. In his early days, he was 'thrown' into the creative world purely by chance, as he wasn't particularly keen about other college activities. David Shepherd is commonly quoted as saying that upto his late teens his life was not very successful, as he always had an ambition to be a game warden in Africa. So after ending his schooling, David Shepherd left England with the concept of a career within the national parks of Africa. Unfortunately, he was promptly instructed that there was no place for him, and his childhood desires lay in ruins. Throughout school days, his foremost curiosity in art had been as a substitute for the compulsary games of rugby which left him with quite frightened. Unable to understand what would possibly possess people to roll around a muddy rugby pitch and endure horrible injury, David Shepherd took refuge in the faculty artwork department where he produced a hideous picture of some birds, which he brings along with him to this present day when public speaking. After his dissappointment at not been given the chance to be part of Kenya's game warden neighborhood, he managed to find a job in a neighborhood resort on the coast working within the reception for one pound per week. David Shepherd started to paint pictures of birds, and by chance managed to sell seven pictures at ten pounds a canvas, which allowed him to pay for his ticket back to England on the Union Castle steamship. When back in England he saw two possibilities of career for himself. Either David Shepherd could try to make it as an artist, or drive a bus. After careful thought he decided the bus driver choice was by far the safest bet, as it was well-known that almost all artists had little cash or prospects. His father helped at this level and urged that if he actually needed to develop his artistic skills, he would want some training. David Shepherd set off to the Slade school of fine art in London with his bird picture, unfortuinately he was told that he had no artistic ability and that instructing him would be pointless. Driving a London bus was beginning to appear the extra likely possibility, until by complete coincidence, he met an artist called Robin Goodwin who was regarded as a highly skilled marine artist. He never worked with apprentices, but luckily for David Shepherd, he agreed to see some of his work. The very subsequent day David Shepherd arrived at Robin Goodwin's studio in Chelsea with his 'bird' painting, and to David's sheer amazement Robin Goodwin agreed to help him. It is because of this artist that David achieved the creative staus that he enjoys in the present day, and has at all times a feeling of deep gratitude for the help he acquired from Robin Goodwin. 'The Man Who Loved Giants' was the title for this film of David Shepherd's life story produced in 1972 by the late James Stewart. The documentary was shown worldwide. Sawmills Railway and their 12,000 mile journey back to England. through the sale of paintings in USA. A helicopter was bought and given to Zambia to help prevent poaching. Illustrating the plight of endangered mammals throughout the world. These were later broadcast in the USA. 'Nature Watch' with Julian Pettifer began in 1990 and David Shepherd produced the first programme in the series. Last but not least, David Shepherd has been the subject of the programme 'This is Your Life'. Honorary Degree in Fine Arts by the Pratt Institute in New York. The Order of the Golden Ark by HRH The Prince of The Netherlands for his services to conservation. The Order of the British Empire for his services to wildlife conservation. O.B.E. Fellow of the Royal Society of Arts. President Kenneth Kaunda of Zambia awarded him with the Order of Distinguished Service. Honorary Doctorate of Science of Hatfield Polytechnic (now the University of Hertfordshire) in 1990. Officer (Brother) of the Order of St. John. Granted the Freedom of the City of London. The Artist and Conservationist today. throughout the world and he is always on the move and enjoying his life to the fullest. I run almost everywhere I go because I am so anxious to get on with the joy of what I am doing next." which raised over £100,000 for's wildlife projects. attended by a host of celebrities and many admirers of his work. and are involved in the work of various wildlife projects throughout the world..
We have a collection of over 500 David Shepherd signed limited edition prints and original paintings for sale. A viewing can also be arranged at your home. Signed, limited edition, prints and original paintings, drawings for sale. 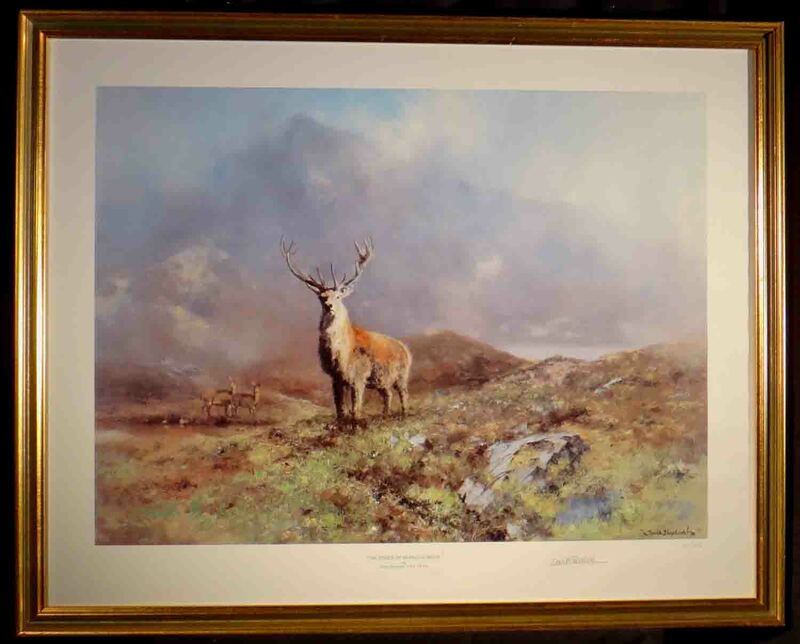 We specialise in David Shepherd paintings and limited edition prints. 30 years experience and a collection of hundreds of David Shepherd signed, limited edition prints in the UK! Studio open 24 hours a day, 7 days a week! We specialize in signed prints and original paintings and drawings by the world acclaimed artist L.S.Lowry. they are proving to be an excellent investment, much greater than any current banking investments. A watercolourist, whose work needs little introduction in the world of art is Sir William Russell Flint. We stock hundreds of this artist's signed limited edition prints and always a fine selection of his original watercolour paintings. in particular Dordogne and the Perigord, where this beautiful holiday house is to let. and offers complete tranquility and relaxation. There are also a number of signed limited edition prints of paintings from Britanny, The Loire, Ardeche, Provence. His work has now become regarded as some of the finest watercolour paintings in the world.